A number of people sent me documents, pictures, and links relevant to bike/ped transportation after last week’s meeting. This post collects them all. 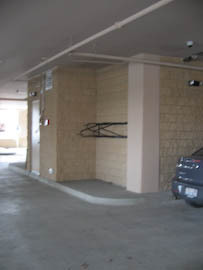 Gallery of Karen Behm’s Issaquah bike rack photos. At the Council Transportation Committee this past week, Councilors learned that the following locations could get bike lane improvements in 2008 within the Complete Streets program. These locations would involve restriping only of existing roads. They have not been cross-referenced with the Bike/Pedestrian section of the Transportation Element that we worked so hard to incorporate bike facilities into. So take a look & respond to Gary Costa & Todd Christensen with comments or additional locations. If you send feedback to the city, be sure to mention that you’re a member of GAIT. We’ll work out official membership soon, but for now if you read this blog, join the mailing list, or come to a meeting or event then you’ve got the right to call yourself a member. Tonight GAIT had its first meeting. Ten of us sat at a table at the Issaquah Brewhouse and talked about bicycle and pedestrian issues in Issaquah. Rob, Nina, Barb, Karen, David, Kent, Erik, Karen, Becky, and me. Some of these may already have sufficient racks in place. 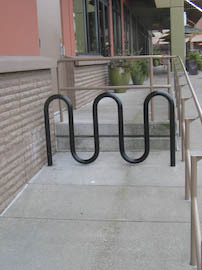 We thought we’d prioritized public locations ahead of private businesses thinking we might be able to lobby businesses into installing racks on their own. There are a lot of unknowns about the program so next steps here are to refine the list and get some pictures taken of where we’d like to place racks, and then to contact Kryptonite to see what they’re willing to do. Beyond the bike rack program a lot of ideas flew across the table. I’ll try to get some pages here on the website to capture some of that over the next few days. There were also some war stories told about various organizations, but you’ll have to come to a meeting if you want to hear any of those. It was exciting to see so many interested people there. Suddenly I have no qualms about referring to GAIT as a “group” and using the word “we” when talking about it. That alone is a big step forward. Thanks, everyone!